« The Dogwoods Are Starting To Bloom! Nice sunny, 66 degrees right now with very little (what a change) wind. And, the wind should stay calm today. Friday is predicted to be in the low 70s with winds light and variable. 70s through the weekend and into early next week. Mid week is slowing low 80s. We do have a slight chance for Sunday showers continuing into Monday. I think I heard showers would be later in the day Sunday, if we get some. No change in the generation pattern here on Taneycomo….it continues to run non-stop. All I can say is that we are at 915.8′ on Table Rock Lake right now. but everyone had a good day catching fish. Beautiful fish Richard! Wednesday, Dana took Jeff, from Defiance, MO out for half a day. They had a good day on the size 16 red midge dropped under the big ruby and also stripping the CQ streamer. Yesterday, Stan took Mat from Virginia out for a good day on the water. Mat was skeptical about catching fish in this much water, but it turned out to be another good day. Big ruby with either a red midge or lightning bug dropper and stripping the CQ streamer. 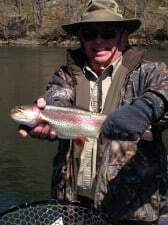 A reminder – APRIL 26, Full Day Fly Fishing Clinic. We still have some room in this clinic if you, or you know someone who wants to get started fly fishing. Half day classroom working on knots, understanding equipment, and a little bit about bugs in the morning. After lunch it’s to the water to learn roll cast, pick up and lay down cast and shooting line. If we’re lucky, we might hook and play a fiah! This entry was posted on Thursday, April 17th, 2014 at 1:07 pm	and is filed under Fishing Reports. You can follow any responses to this entry through the RSS 2.0 feed. You can leave a response, or trackback from your own site.